Enchilada Stuffed Zucchini, a satisfying, easy dinner the whole family will love! Brown ground beef in a large skillet over medium-high heat. Drain any excess fat. Add the beans, corn, cilantro, taco seasoning, cumin, garlic powder, onion powder, and salt. Mix until combined and cook until fragrant, one minute. Add the water and mix to combine, lower heat to medium-low, simmer until almost all the water is evaporated but the mixture is not dry about 3-5 minutes. Take off the heat, and let cool until ready to use again. Cut zucchini in half length-wise and scoop out the seeds, leaving about 1/4 inch of the zucchini flesh. To make this easier I use a melon baller, be careful not to puncture the sides of the zucchini. In a large bowl, add the egg, breadcrumbs, and 1/2 cup of the cheese. Add the meat mixture and mix to combine. Next, make the sauce. In a medium-sized saucepot, add the butter and let melt over medium heat, add the cornstarch and whisk to combine, cook for one minute. Add the chili powder, whisk to combine, cook one additional minute. Slowly pour in the chicken stock, whisking constantly to avoid lumps. Add the remaining ingredients, whisk to combine. Stir occasionally until thickened, about 3-5 minutes. Preheat oven to 350°F degrees. Add about 1 cup of the sauce to two 9x13 inch baking dishes. Distribute the stuffing evenly among the zucchini boats. Place each zucchini half into the baking dish, cover with foil and bake for 30 minutes. Remove the foil, add the remaining cheese and bake an additional 15 minutes. Serve with remaining sauce and toppings of your choice. *If you like a lot of sauce, double this recipe. 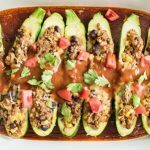 Enchilada Stuffed Zucchini Recipe found on https://thissillygirlskitchen.com/enchilada-stuffed-zucchini/ *All nutritional information is approximate and may not be 100% accurate. Please consult a nutritionist for more specific information.